Squamous cell carcinomas make up almost 30% of all skin cancers in South Africa and there were 6500 new cases of squamous cell carcinomas reported in 2013 according to the South African National Cancer Registry. These statistics are much higher than the statistics of squamous cell carcinomas globally where they make up a mere 10% of all skin cancers. As they are more aggressive malignancies as compared to basal cell carcinomas, this is a critical fact. They can become disfiguring and sometimes deadly if allowed to grow and carry a 2-6% risk of metastasis. These are not malignancies to mess around with! They are most commonly found on sun-exposed areas as UV exposure is the most important risk factor but squamous cell carcinomas can also develop in skin damaged by other forms of radiation, in burns and persistent chronic ulcers, wounds and in old scars. 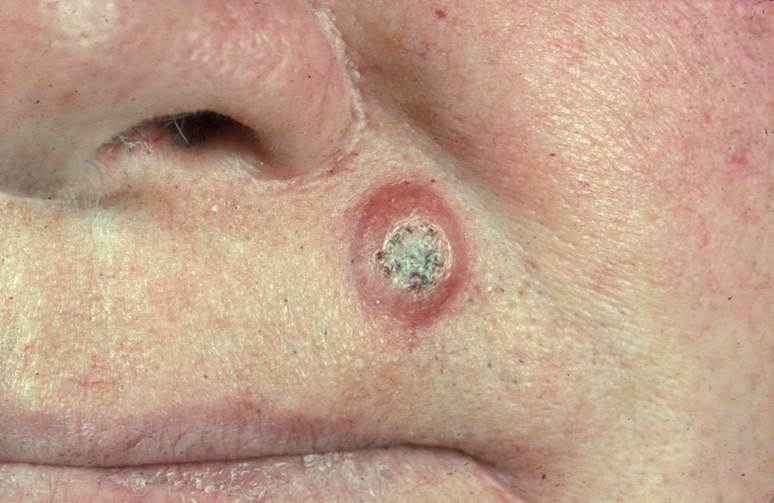 They often look like scaly red patches, open sores or warts; they may crust or bleed. Please visit our experienced team of dermatologists at Atlantic Dermatology and Laser if you have noticed any lesion of concern for immediate attention.